LONDON – Just days ahead of the opening of the Winter Olympics in Sochi, a new documentary airing Wednesday on Britain’s Channel 4 sheds new light on the violent, homophobic attacks on LGBT Russians. 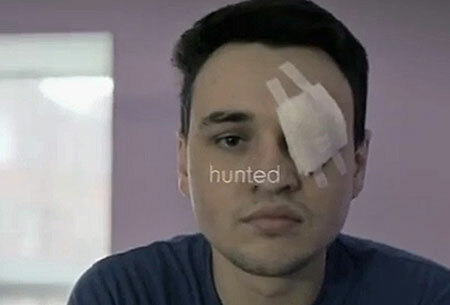 The documentary, produced by freelance investigative journalist Liz MacKean, is titled “Hunted,” named for remarks made by one of the film’s subjects, Dmitry Chizhevsky, who was beaten and shot in the eye last November during an attack on the LGBTQ community center in St. Petersburg, Russia. The broadcast focuses primarily on the anti-gay vigilante groups “Parents of Russia” and “Occupy Pedophilia,” which many gay rights activists and advocacy groups allege are given a license to promote anti-gay animus and attack LGBT Russians because of the country’s law banning the promotion of “non-traditional” relationships. “The LGBT community in Russia has been turned into public enemy number one and the fact is they are hunted, they are assaulted, they are humiliated,” said MacKean. “The law clearly encouraged hostility towards gays,” said MacKean, of the anti-gay propaganda law signed by Russian President Vladimir Putin last June. The full video has been posted online. On Tuesday, Human Rights Watch posted a collection of video clips documenting anti-LGBT violence that are being used by the groups to promote themselves online.